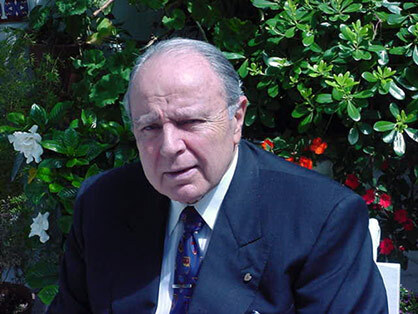 Domingo Liotta - International Foundation - Medical Corp.
2- as a bridge for Myocardial Recovery. However, as a matter of fact, the whole being of LVAD laboratory research and its earliest clinical application occurred four decades ago. Liotta D, Hall CW, Henly WS, Beall AC, Cooley DA, DeBakey ME. Prolonged assisted circulation during or after cardiac and aortic surgery 1-Prolonged Left ventricular bypass by means of an intrathoracic circulatory pump. II- Diastolic pulsation of the descending thoracic aorta. Trans Am Soc Intern Organs ,1963; 9 :182-185. Liotta D, Hall CW, Henly WS, Cooley DA, Crawford ES, DeBakey ME. Prolonged assisted circulation during and after cardiac or aortic surgery. Prolonged partial left ventricular bypass by means of intracorporeal circulation. Am J Cardiol, 1963; 12: 399-405. This paper was finalist in: The Young Investigators´ Contest Award of the American Society of Cardiology, Denver, May 1962. Liotta D, Hall CW, Cooley DA, DeBakey ME. Prolonged ventricular bypass with intrathoracic pump. Trans Am Soc Intern Organs, 1964; 10: 154. Liotta D, Maness JH, Bourland H, Podwell D, Hall CW, DeBakey ME. Recent modification in the implantable left ventricular bypass. Trans Am Soc Intern Organs, 1965; 11: 284. Liotta D, Hall CW, Villanueva A, O’Neal RM, DeBakey ME. A pseudoendocardium for implantable blood pumps.Trans Am Soc Intern Organs,1966;12: 129. Novel LVAS may be a bridge to cardiac transplantation. However, the main indication is functional heart recovery in advanced heart failure. We chose the atriostomy method (pump’s inflow). A large opening in the left atrial wall for blood inflow to the implantable pump is made, a 25-30 mm diameter atrial prosthesis is sutured on the epicardial side of the left atrial wall ( at the atriostomy opening).The atrial prosthesis has incorporated a metallic frame, which keeps the atriostomy permanently open. We synchronized the pump to the patient’s electrocardiogram, to ensure blood pump ejection in diastole (counterpulsation hemodynamic effect, that improves mainly coronary circulation). The key to success is the atriostomy technique, which creates an opening larger than the patient’s mitral valve, thus avoiding the cannulation of cardiac chambers.
" The means for connecting to a heart chamber and a vessel comprises an atrial prosthesis configured to be sutured to the wall of the left atrium".
" The atrial prosthesis comprises an annular base, a tubular portion and an annular support, fixed around an intersection of said annular base and said tubular portion, wherein the annular support maintains the structural shape of the prosthesis and the left atrial chamber". Novel LVAS-I and II can be implanted trough a median sternotomy, a regular thoracic surgical approach for heart surgery. Corrective heart surgery (coronary, valves) can be undertaken, and at the same surgical act a Novel LVAS is implanted, to treat extreme heart failure patients. Heart Recovery, with implantation of Novel LVAS-I — which we repeat now, left undisturbed the myocardial fibers of the left ventricle-- and concomitant transplantation into the injured myocardium of stem cells from the patient’s bone marrow, might open a new era in the treatment of end-stage heart failure. Laboratory research employing left atrial prostheses as inflow connector of continuous flow pumps is underway. Myocardial remodeling represents a common process of progressive ventricular hypertrophy, enlargement and cavity distortion over time. With adverse remodeling the geometry of the left ventricle changes, evolving from an ellipsoid to a sphere and the pathophysiological processes in patients with stage C heart failure eventually result in refractory, end-stage disease (from stage C to stage D heart failure). Surgical treatments of reverse remodeling are promising new avenues. Partial unloading by means of an LVAD and drug therapy —metabolic therapy— is one of the most fascinating developments in cardiac surgery (1,2). There is no doubt that left ventricular assist devices —mechanical ventricular decompression— may sustain therapies that enable reverse remodeling to improve myocardial energetics and to prepare the heart for removal of the device therapy. It is a new horizon in the treatment of heart failure. It offers important changes at the cellular and molecular biology where major battles will be won in the war against the failing heart. However, instead of cumbersome clinically used devices, better LVAD designs are mandatory. The new generations of pulsatile LVAD should be smaller, safer, more reliable and easier to implant. The left ventricle’s apex is the inflow blood path of commercially available pumps. A trocar cuts a circular portion of myocardium to allow the insertion of the left ventricular inflow connector (18 to 20 mm ID) and approximately, 12 anchoring stitches with Dacron pledgets are placed around the apical myocardium orifice. This procedure destroys the helical shape of the left ventricular myocardium. It is affected the power of contraction and relaxation that the left ventricle exerts over its major axis of rotation (from apex to base) (3,4). Normally the external inspection of the heart from the apex to the base shows a clockwise (systole) and counterclockwise (diastole) spiral motion of the myocardium, which is responsible for the heart rotation during the cardiac cycle and for ejection (systolic period) and suction activity (diastolic period). Hence, it is perfectly true that further power loss of left ventricular contraction can undeniably be catastrophic —and apical hypokinesis after explantation-- in a patient who is attempting myocardial recovery. The inflow blood drainage to the Novel LVAD-I, II and III is through a 25- mm- diameter left atriostomy (surface area 4.6 cm2) (5,6). The aortic root in the Novel LVAD III is directly sutured to the atrial wall at the atriostomy opening. An interrupted suture technique employed. The pledgeted sutures run from outside the atrial wall to the endocardium, folding over the latter to contact the cuff of the valved-aortic root; the pledgets remain at the atrium external surface. The ascending aorta (5-6 cm long) is sutured to the pump. Thus, biological tissues comprise the critical blood path of pump’s inflow. The Prolonged Total Unloading—currently recommended— prompts myocyte atrophy and increases collagen cross-linking and myocardial stiffness (7). Moreover, it may result in a major complication, dysfunction of the interventricular septum and it may require biventricular device insertion (LVAD and RVAD). In addition, there is usually no passage of blood through the aortic valve, which remains closed. Patients with a mechanical or biologic valve in the aortic position are therefore at high risk of thrombosis. Furthermore, blood stagnation at the left ventricular outflow tract may also be the source of fatal thrombo-embolic episodes. The Partial Unloading of left ventricle, in our clinical experience, employing the left atrium as the pump inflow connection (atrial prosthesis) is of great simplicity. The left ventricular diameter during systole and diastole, the ejection fraction, the left atrial diameter and the flow through the aortic valve are echocardiographically measured. The left atrial (wedge) pressure is monitored constantly immediately after implantation. The LVAD output is regulated from 4 to 5 L/min with a pump’s rate ranging from 55 to 70 bpm, the systolic pneumatic pressure is fixed at 200-220 mm Hg and the systolic ejection fraction at 35% of the pump’s stroke cycle. The pneumatic driver line is 4-mm ID. We let the native heart eject approximately 1.5 to 2 L/min and the aortic valve must be seen well open in each systolic ejection. After two or three days, the patient is well adapted to the new hemodynamic situation and echocardiographic controls are required only periodically (unpublished data). An ECG-synchronized LVAD offers an additional prospect of reversing profound heart failure. The heart is under beta-adrenergic blockade and aldosterone antagonists, which helps adjust the patient´s heart rate to the pump. Mechanical ventricular decompression improves myocardial contractile properties and increases beta-adrenergic responsiveness (8). Novel LVAD may run asynchronously, although it generally operates in synchronous counterpulsation mode (9). NOVEL III LVAS´ drive unit is an air-driven system. The driving parameters can be programmed and manually preset. 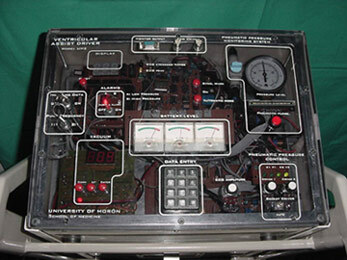 This electro-pneumatic unit contains three modules: a) pneumatic system; b) main control module (MCM) with a synchronization circuit; and c) battery charger. A remarkable feature of this driver system is that it contains two pneumatic units that alternate in their function every 15 minutes. This prevents overheating and component fatigue or failure, and it enables the use of smaller units. If one of the systems fails, an alarm will warn about the problem and the other will continue indefinitely. This LVAS is synchronized with the patient's ECG, allowing the stroke volume to be ejected during the diastolic period and in this way acting as a chronic counterpulsator. With the latest developments in our NOVEL III LVAS, it is possible to monitor the driver´s functioning and the clinical parameters of the patient on line from a remote place, even at an international level. This is possible through a driver-computer connection by means of Internet/Intranet, both from the intensive care unit and the patient´s home. The development of a system which may be accessed by means of Internet (by entering a password) will allow the exchange of information among specialists of mechanical circulatory systems all over the world. 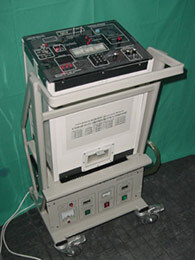 2. several parameters of the driver´s work: pneumatic pressure and synchronization of the patient´s ECG. It is also possible to incorporate from a Web site the clinical history and echocardiographic and X-ray studies, being feasible a teleconference with the doctors in charge of the patient´s care and even with the patient himself. A third report came out: Cervino C. , Nasini V., Sroka A., Pham S.M., Liotta D.; Novel LVAD system-The Driver; Texas Heart Institute Journal 2005;32:535-40. A remarkable feature of the driver system is that it contains 2 pneumatic units that alternate in their function every 15 minutes. This prevents overheating and component fatigue or failure, and it enables the use of smaller units. If one of the units fails, an alarm will warn of the problem, and the other will continue indefinitely. Novel LVAD-III is implanted under CPB via a left thoracotomy. Atrial prosthesis in calves could be sutured while the heart is beating, thus extracorporeal circulation is avoided. The technique has already been published (5). At the clinical setting the aortic root is sutured with the patient under extracorporeal circulation. The aorta is unclamped and the heart is not ischemic. Figure 2, shows the geometry of the blood flow path, which places an imaginary vault-like line from the left atrium, going through the fifth intercostal space, to the upper descending thoracic aorta. A 25-mm valved-aortic root (full aortic root) is sewn to the 25-mm-diameter atriostomy (area 4.6 cm2) with an interrupted suture technique. Approximately 12 anchoring stitches with Teflon pledgets are placed around the orifice of the atriostomy. The pledgeted sutures run from the external surface of the atrial wall (visceral pericardium) to the endocardium. Consequently, the endocardium is folded over when the sutures are tied to contact the cuff of the aortic root. The pledgets remain outside the atrial wall. The titanium blood housing is fixed under both the fifth and sixth ribs at the fifth intercostal space. Figure 2 : Design features of the intrathoracic Novel LVAD-III. The cross section follows the axis from the inflow port, passes through the 8-centimeter titanium pump housing (positioned at the fifth intercostal space) and continues along the axis of the aortic graft to the upper DTA. LA: left atrium, AR: valved-aortic root, TR: titanium ring, AA: ascending aorta, TH: titanium housing, BC: blood chamber, PL: pneumatic driving line. (1) Birks EJ, Tansley PD, Hardy J, George RS, Bowles CT, Burke M, Banner NR,Khaghani A, Yacoub MH. Left ventricular assist device and drug therapy for the reversal of heart failure. N Engl J Med, 2006;355(18):1873-84. (2) Neubauer, Stefan. The failing heart – An engine aut of fuel. N. Engl. J. Med. 2007, 356: 1140-51. (3) Buckberg GD, Coghlan HC, Torrent-Guasp F. The structure and function of the helical heart and its buttress wrapping. V. Anatomic and physiologic considerations in the healthy and failing heart. Semin Thoracic Cardiovasc Surg 2001;13:358-85. (4) Buckberg GD, Coghlan HC, Hoffman JI, Torrent-Guasp F. The structure and function of the helical heart and its buttress wrapping. VII. Critical importance of septum for right ventricular function. Semin Thoracic Cardiovasc Surg 2001;13:402-16. (5) Liotta D. Novel left ventricular assist system. Tex Heart Inst J 2003;30:194-201. (6) Liotta D. Novel left ventricular assist system II. Tex Heart Inst J 2004;31:278-82. (7) Klotz S, Foronjy RF, Dickstein ML, et al. Mechanical unloading during left ventricular assist device support increases left ventricular collagen cross-linking and myocardial stiffness. Circulation 2005;112:364-74. (8) Ogletree-Hughes ML, Barrett-Stull L, Smedira NG, McCarthy PM, Moravec CS. Mechanical unloading restores beta-adrenergic responsiveness in the failing human heart [abstract]. J Heart Lung Transplant 1999; 18:63. (9) Cervino C, Nasini V, Sroka A, Diluch A, Cáceres M, Sellanes M, Malusardi A, del Río M, Pham S, Liotta D. Novel left ventricular assist systems I and II for cardiac recovery. The Driver. Tex Heart Inst J 2005;32:535-40.